The Friends of the San Pedro River will host Steve Pawlowski, the Water Sentinels program coordinator for the Grand Canyon Chapter of the Sierra Club. Come learn how we can use citizen science, hands-on conservation, and advocacy to help shape a more sustainable future for one of the most ecologically significant rivers of the Southwest. March 20 at 7 p.m. at the BLM/Forest Service public meeting room, 4070 E Avenida Saracino, Hereford (off Hwy. 92 between Ramsey and Carr Canyon Roads). The lecture is free and open to the public. 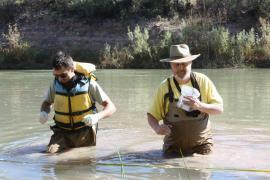 For more info, call 520-459-2555 or visit www.sanpedroriver.org. This entry was posted in Education, Events, River Protection, Volunteers by Robert Weissler. Bookmark the permalink.